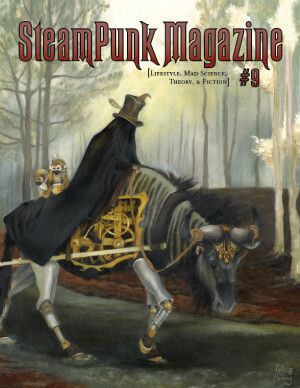 Steampunk Magazine » Issue #7 Released! It always gives us great pleasure to announce the release of a new issue of the magazine, and this one more so than most as we genuinely believe that Issue #7 is our best ever. There are articles on steampunk’s relationship with politics, the future of steampunk fashion and the melting pot of 19th century Europe, poems about Alice in Wonderland, fiction about airships and hot air balloons (how very retro!) and instructions on how to raise your own island out of the deathless oceans. On top of all of that, there are interviews with Sunday Driver and The Men That Will Not Be Blamed For Nothing, and a good helping of all the other wonders that you have come to expect from SteamPunk Magazine. As you should all know by now, SteamPunk Magazine is available in print through Strangers in the Americas and Vagrants for the rest of the world, and can also be downloaded for free from (unsurprisingly) our downloads page. Another piece of exciting news: as of this issue you can also go to our downloads page to purchase an ultra-cheap (one English pound) pdf version of #7 that has been optimised for viewing on your iPhone or other associated eReader, should you have one. We don’t (our phones still have Roman numerals on them), but we’ve heard rumours that some people like them a lot.